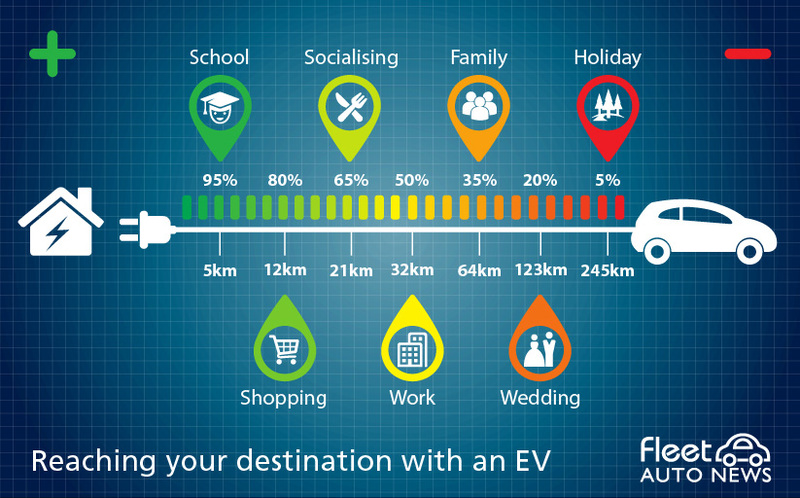 Home Electric Vehicles Do you measure distance in percentages or kilometres? Do you measure distance in percentages or kilometres? Do you measure range as a percentage or in kilometres? How you answer will determine your readiness for electric vehicles. On a recent Tesla loan drive I was surprised by the reactions of people when we discussed range in percentages; it gave them anxiety. Considering mobile phones have taught us about battery life in percentages, I thought it was a simple interface that translated to cars. As it turns out I was ok with it because I’m one of two-third of Aussies that see electric cars as inevitable and expecting my next car to come with an extension cord. But people (and maps) still talk in kilometres because they use their car to travel distances not ratios. Driving the Tesla I had no issue looking at the battery symbol and the percentage remaining. There was a trip meter telling me how many kilometres I had already travelled so I just did the math to work out the range remaining. And I knew that I parked the car in at work for at least eight hours everyday so charging wouldn’t be a an issue (even with a slow charger). Then I took a trip to Melbourne and noticed how the airport waiting areas have changed to accomodate people’s addiction to their mobile devices. No longer do people look like ‘electricity addicts’ sitting on the floor guarding their precious powerpoint while charging their phone. Airports have recognised the growing need for power and now provide travellers with endless charging opportunities. And they have adopted an ergonomic approach with standup work spaces near each gate. This approach is also being adopted for electric vehicle charging by shopping centres, carparks and councils. I call it ‘Replenishment charging’. Everyone has two issues with range, 1) How long does it take to charge? 2) How far can I travel once I’m charged? These two questions assume that you need to drive until the battery is empty and then charge it 100% (like you fill your car 100% with petrol). Replenishment charging means you charge as you go, wherever there’s an EV charge point. Grocery shopping takes an hour or two – that’s 50 kilometres. Dinner and a movie take four hours – 100 kilometres. Parking at home overnight for eight hours – 400 kilometres! And this is quite easy to do once you start driving an electric vehicle. There are charge points everywhere in your daily routine. The human brain is very adaptable and once you stop looking for petrol stations you’ll find electric vehicle charging opportunities all over the place – with lots more coming. Tesla makes it easy because the navigation system has all the charging opportunities mapped. At first I needed to spend some time route planning (a good eco-driving and safety tip) to be comfortable with the distance between my destinations and the remaining battery range. After three days the ‘range anxiety’ disappeared and I realised that I could complete all my errands (groceries or being a taxi for the kids) and replenish the battery in the Tesla at the same time. And the great parking sports were an unexpected bonus because there’s always a dedicated EV parking bay near the shopping centre entrance. I guess the ‘replenishment’ charging method is like being a teenager and driving a petrol car. You never had enough money to completely fill the tank so you regularly topped it up with the spare $10 or $20 in your wallet that wasn’t allocated to alcohol consumption. If you think about it this way – electric vehicles will make you young again! As a Fleet Manager, do you understand the new CoR laws?